First, I questioned them about what they get excited to buy when it’s hot out (as it was that week). I asked if sticks were helpful or useful, if $20 was a fair price that others would pay. I suggested selling something they personally would love, and for a price they’d be willing to pay. 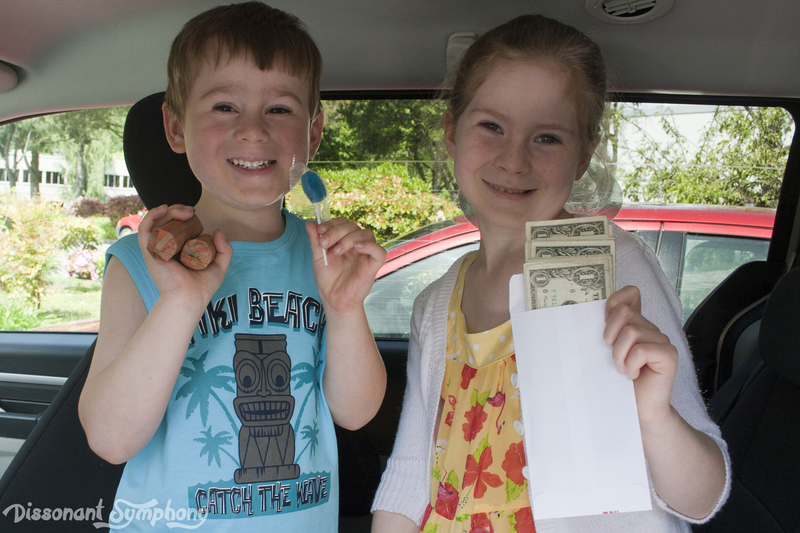 My munchkins put their heads together, and thus the Pit Stop Popsicle Shop adventure was born. 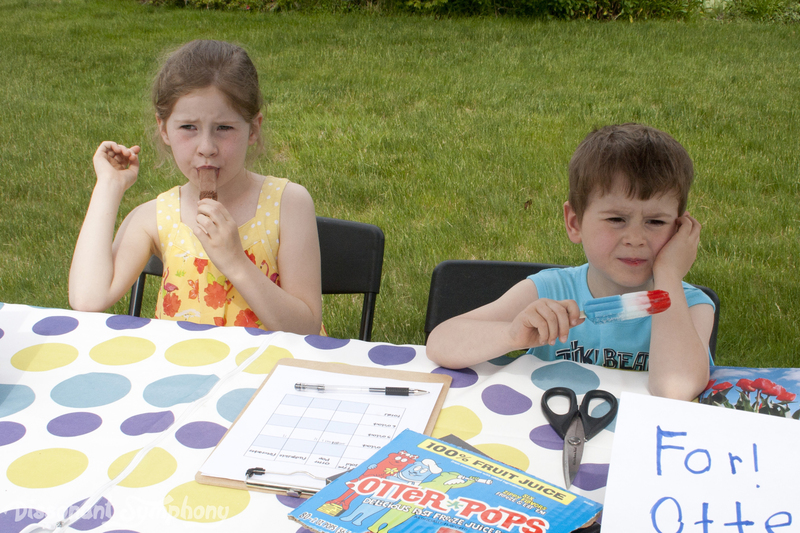 First the kids decided what kind of popsicles they wanted to sell. We hit the store to locate the most desirable frosty treats. 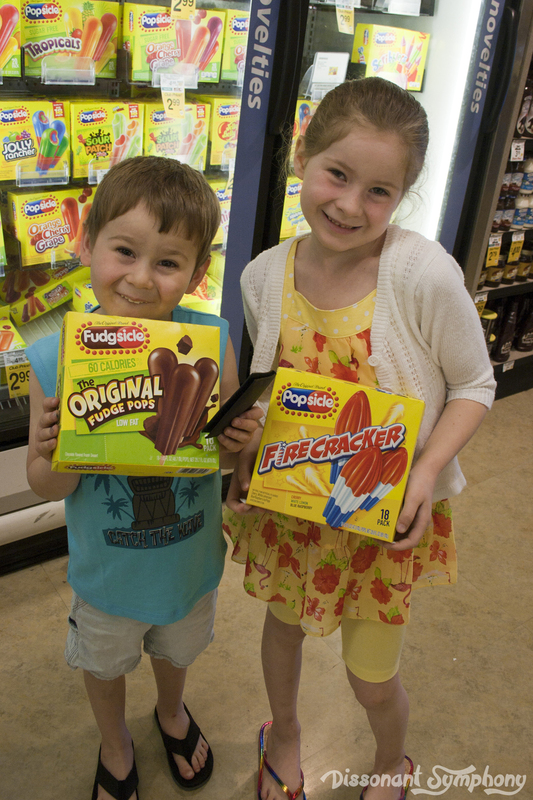 Fudgsicles and Firecrackers were the winners by nature of being delicious AND on sale. 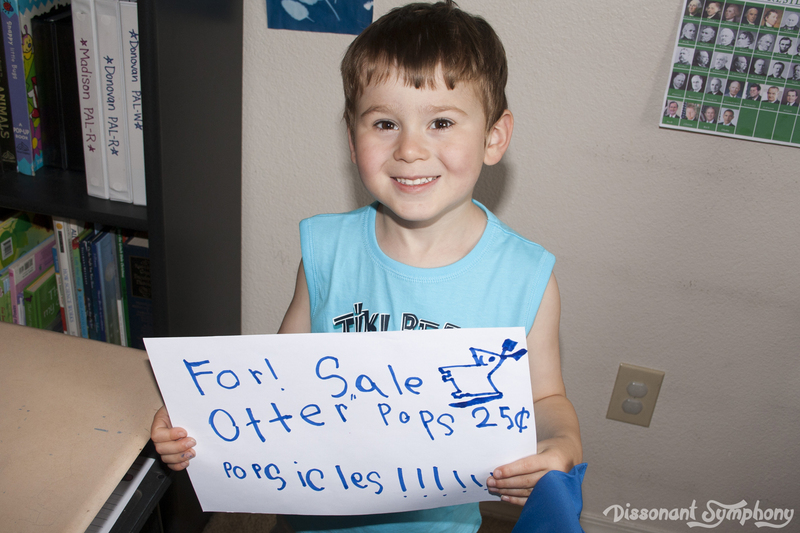 We threw in some Otter Pops from the freezer as well. Then we had a lesson in economics. 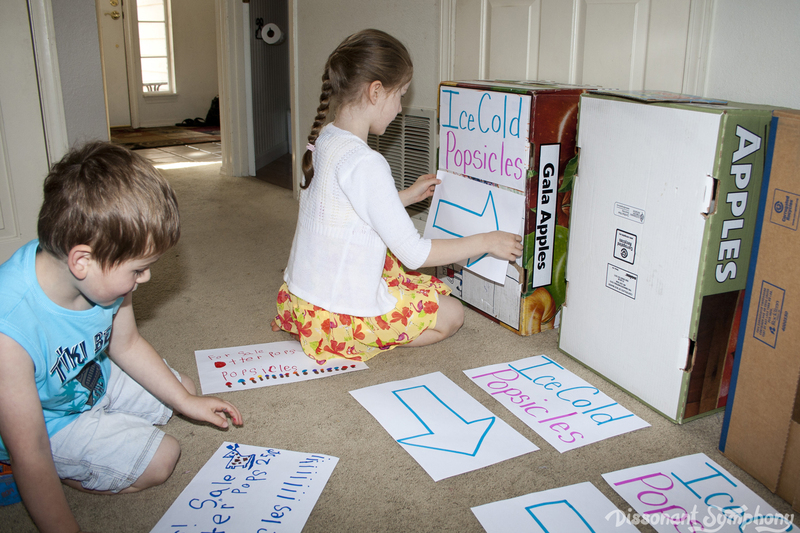 The kids figured out how much they’d spent on the boxes, how many were in each package and what they should sell their treasures for that was reasonable, but would still make them some coin. Next, it was time to make some marketing materials. 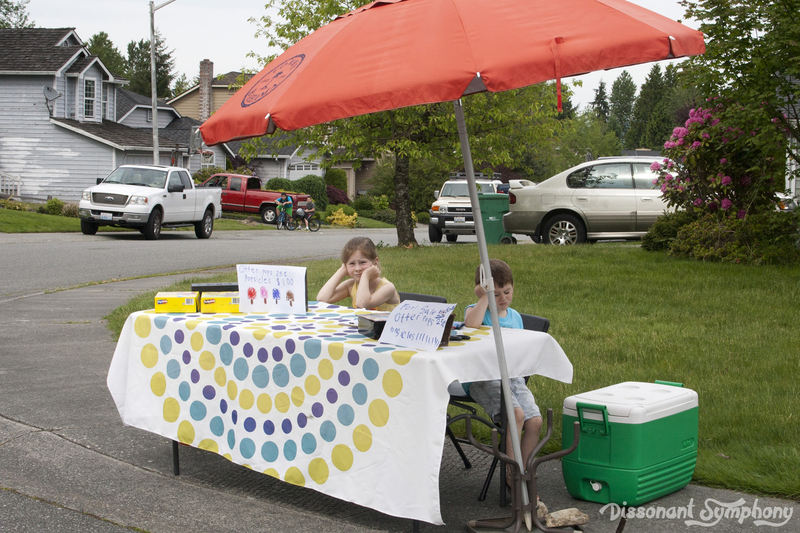 My little entrepreneurs put me to work creating the signage for out on the road to draw cars towards their stand, and then we taped the signs on old Costco boxes so they’d stay visible around the neighborhood. We hit the bank for some change. And a free sucker from the counter! Then found a good corner to set up shop at. I had the kids think through what they’d need to set up their little store to be comfortable and draw in people. 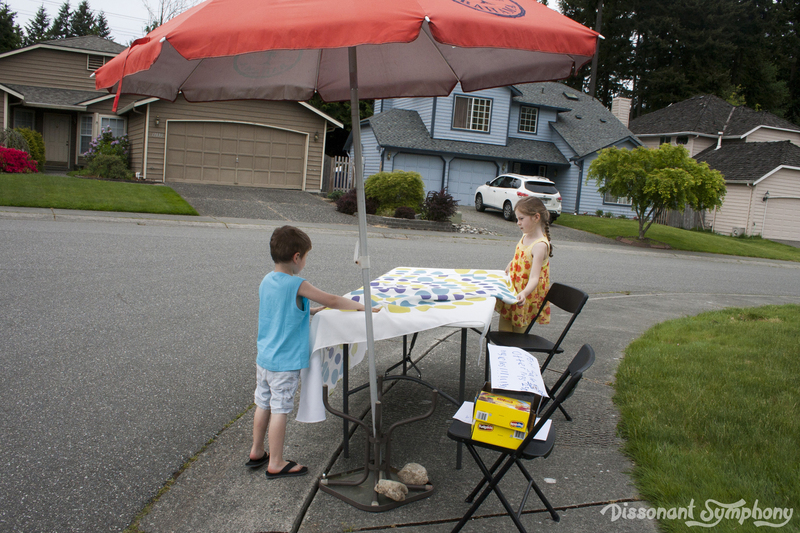 They decided we needed an umbrella, tablecloth and music. 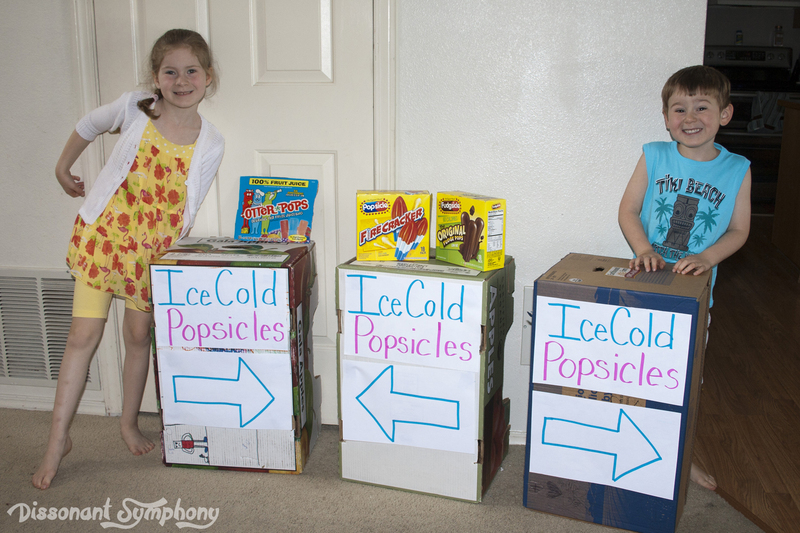 Music was a must, because, they reasoned, that’s what tells people the popsicle man is coming. 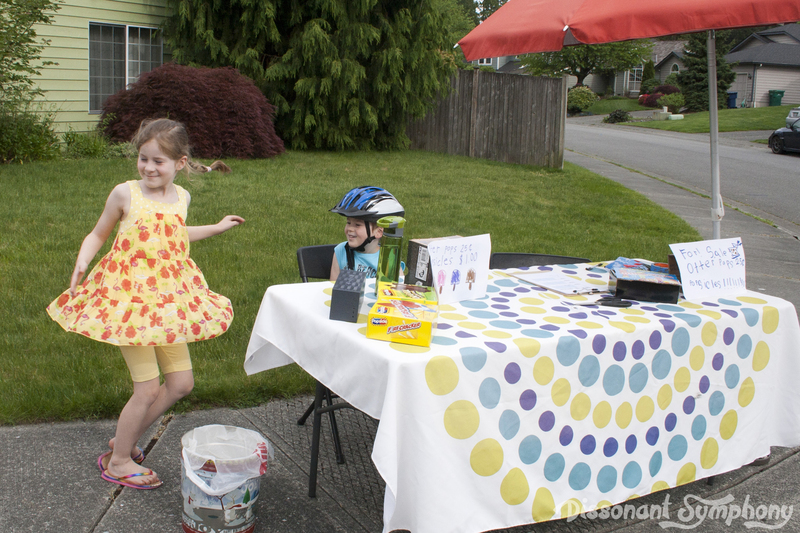 They set up and got ready to make buckets of money. Briefly, I thought they might quit before their first customer. 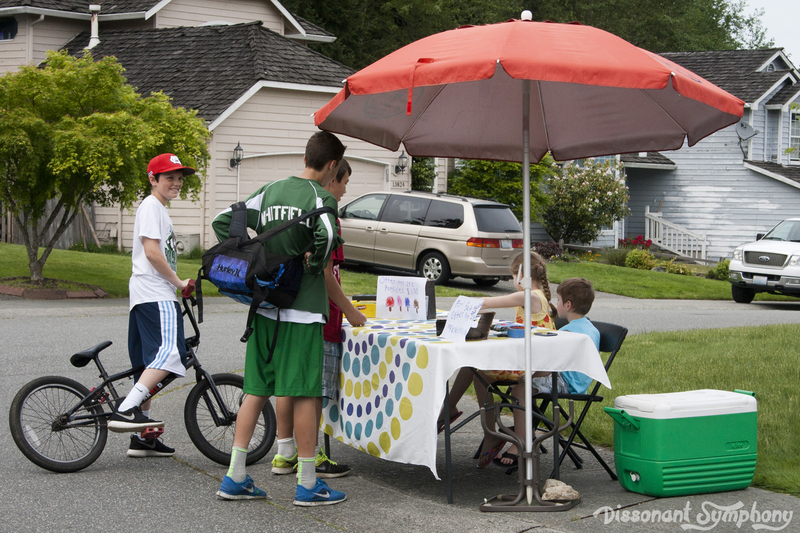 But then the neighbor boys came riding up in a hoard of bicycles, gym shorts and tube socks to save the day. They were back several times that afternoon. After a busy first hour, the kids were hot and mildly grumpy. 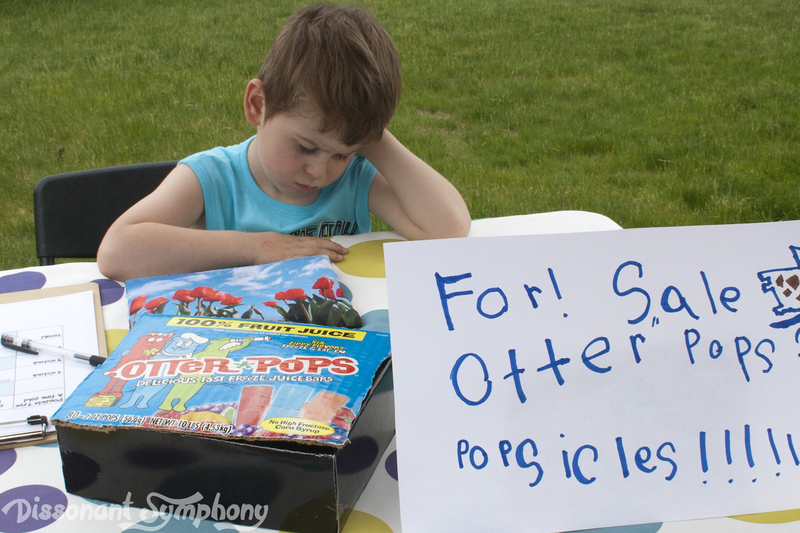 Selling popsicles and not eating any themselves was an extremely difficult chore. My co-owners calculated what they’d made compared to how much it cost to purchase their supply and made the business decision to take a break. They consumed their merchandise (and their profits) and found themselves in a much better mood. There may have been a spontaneous dance party on the sidewalk. Then the business of selling frozen treats picked back up. We kept track of how many of each kind of popsicle we sold each hour (market research for next time), and my daughter practiced her change making skills during each transaction. 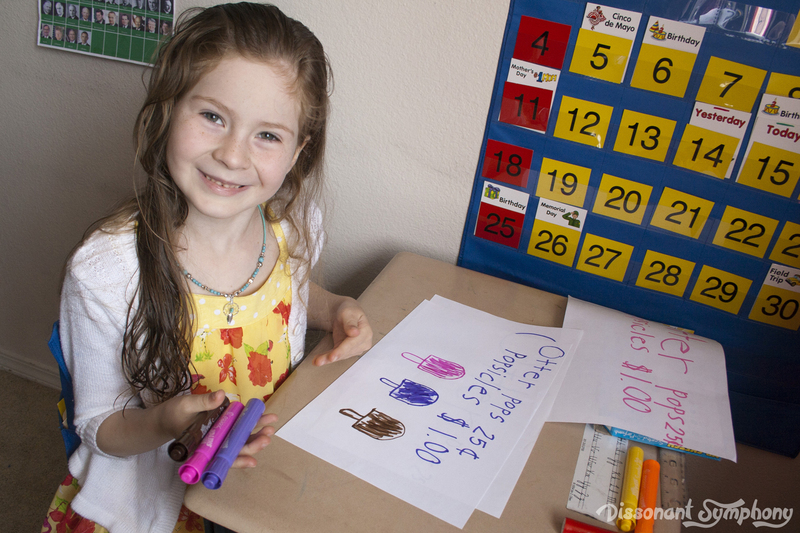 The huge take away for my kids was how time-consuming it is to make a very small profit. We discussed the value of a dollar, a conversation that made me feel decidedly like my father, and what working hard for something looked like in reality compared to how they thought it would be. All in all, a great project to broaden their perception of business, work and money. 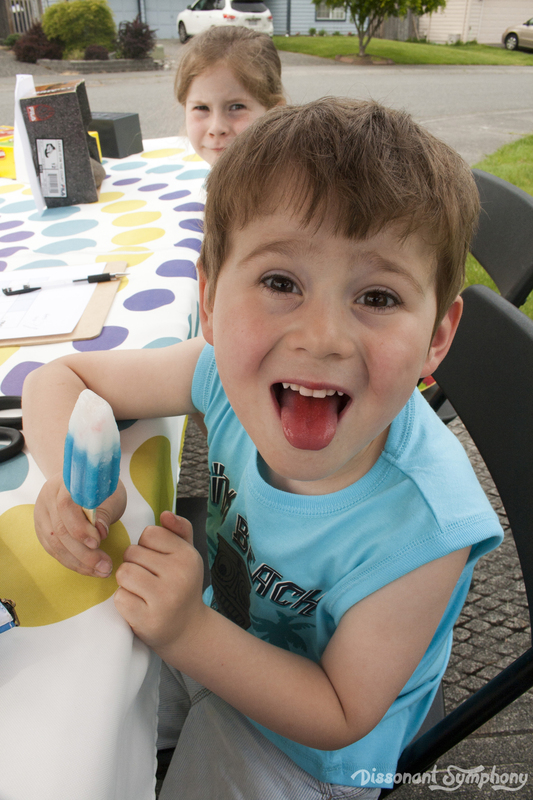 I’m sure we’ll be popsicle standing more this summer.